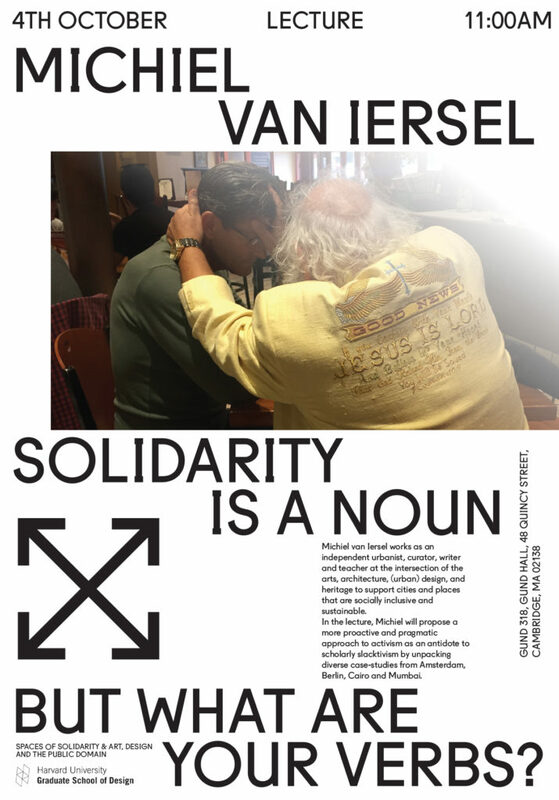 The lecture will take place in the framework of the course: Spaces of Solidarity. The course aims at examining community-driven spaces and spatial processes that pool and share resources to build social cohesion in times of crisis or absence of government, at a variety of scales, places, and contexts. It also attempts to explore environments of community formation and open up a dialogue on the agency of design in enacting and facilitating actions of solidarity. Michiel van Iersel is currently a Loeb Fellow at Harvard GSD. He works as an independent urbanist, curator, writer and teacher at the intersection of the arts, architecture, (urban) design, and heritage to support cities and places that are socially inclusive and sustainable. He cofounded Non-fiction, an Amsterdam-based collective interested in the creation of public values and engagement through artistic means and new rituals. The collective’s exhibitions and publications, research, projects, and events bring people and ideas closer together around such diverse topics as the future of heritage and the Post-Fossil City. Van Iersel is a tutor at the Gerrit Rietveld Academy/Sandberg Institute and research fellow at the Academy of Architecture in Amsterdam. He cofounded De Verdieping, a temporary project space for experimental culture, and the ongoing research project Failed Architecture, about architectural and urban failures around the world. He was curator of the 2016 International Architecture Biennale Rotterdam and recently cocurated Places of Hope, an exhibition for Leeuwarden-Friesland European Capital of Culture 2018. In the lecture, he will propose a more proactive and pragmatic approach to activism as an antidote to scholarly slacktivism by unpacking diverse case-studies from Amsterdam, Berlin, Cairo and Mumbai. This lecture is hosted by MDes Art, Design and The Public Domain, and course DES-3369: Spaces of Solidarity.